EX Fico 685. At the time of applying, I had an old Amex Green card that was charged off three months ago. It went into collections when I started my photo business 4 years ago, but I had been making regular small payments on it and then paid the last $1300 when the CO happened. It was just timing that they occurred at the same time. I have also been an auth user on my partner's platinum card for the past several years on which I've been the only one to both use and pay the card for business expenses. Was approved for $2000. I only applied for this card after reading so many other people's experiences on this thread. I'm really encouraged to know that Amex will give some customers a second chance. I intend to be a customer for life, good karma willing. This is my first Amex card. Not sure why I was only approved for $2K, considering a solid FICO and income and my 5-digit limits on other cards, but I can deal. I have 5 cards, Discover, Capital One, Kohls, Visa, and Mobil with a total of $4200 in credit. I was approved for $6,200 for this card. Annual income of $11,000 (part time college student) and credit score at the time was 716(equifax), and 730(transunion). I was approved for $15k. After I applied, I was given the dreaded "we need to review your application" message. I called recon and was told that there was an old fraud alert in my reports. I was then approved for $5k. My score was about 740. This is one of my lowest limit card. Discover IT gave me $10k. I am an undergraduate with a 735 fico score. I applied was approved for $3.5k. This is enough for my spending. My scores were in the 660s and I got approved for $2k. Got approved for only $3k and I am not sure why. The limit looks rather low to be honest. Did quite a bit of research on this card and finally pulled the trigger. Got approved for $12k with a 740ish score. I was approved for $5k. I was quite surprised when I got this card. TU score of 670 and was approved for only $1k. But this is my first Amex card and I am glad I got my foot in the door. I got a $1000 limit with an average score of 675. I am a little disappointed that my limit is so low because I use the card a lot of grocery and gas. My other cards give me about $4-5k limit. Great card for rewards. I use it for everything. I got a $10k limit with a score of 767. Income was $95000. I like the ticketmaster presales and have already gotten a couple of great seats for concerts. 6% cash back on groceries is simply amazing. I use this card in every supermarket I go to. My scores range from 725 to 735 and I was approved for $12000. The 6% cash back on groceries is the best ever. I got this card with a $8000 limit. Score was 740 on average. One thing to note is that not every supermarket is considered one by Amex. I find that only the big chain stores are. Small boutique groceries are not considered supermarkets by Amex. Had a score of 690 and got approved for $10k. The approval was not instant and I had to wait for about 7 business days. But so far, the experience has been great. This is my first amex card. Score average was 635. Was approved for $2k. Income is $45k. Score was 775 and was approved for $10k. A year later, my limit has been increased to $20k (after a couple of automatic increases). Love the 6% cash back at groceries. Here is the background: I have been rebuilding my credit for close to 3 years. I have 3 baddies and 2 collections from about 5 1/2 years ago. I applied for this card not expecting to get approved. Score at that time was about 625. I was shocked that I actually got approved for $4k. My income was $85k (which may have helped). The approval was not instant and I got a reply about 5 days later. I am signed up for credit karma. They said I had a poor chance of getting approved. But I really wanted this card. So I applied and got approved for $3000. Score was about 615 (CK score). I have a late payment on a student loan about 7 years ago. Otherwise, i consider myself as in a rebuilding phase. My score was about 720 and I got approved for $10,000. I have a short history of less than 2 years. Score is 705. I was approved for $5k. I have the Amex PRG, and SPG ($10k). Decided to go for a "cash back" card to earn more on groceries. I was approved for $15k. Score was 760. My credit took a hit when I was hit by foreclosure years ago. But I have been slowly rebuilding my credit. My score was about 645 and I decided to to go to Amex's pre-approval page and after filling in my score, I was given a few choices. I picked this card and was approved for $5k. Tks Amex. I was approved for $5k with a 725 score. Hope that was helpful. My creditkarma scores were 740. I applied and was instantly approved for $10,000. My total household income was $120,000. Scores were like 799 on average. I was approved for $30,000. My experian FICO 8 score was 785 (very important to know actual FICO rather than FAKO). I was approved for $12,000. My Experian Fico was 700. I have no late payments or derogs on my report. Household income was $110,000. I got approved for $10,000. During the last 2 years, I have brought my scores up from the 550 area to 750 area on all 3 scores. I tried applying for this card when my scores were low 600s but was denied. When I finally applied, the approval was instant and I got $15,000 limit. I think it also helps that I had other cards as well (like Amazon, Chase Freedom and Cap One). Applied with TU Fico of 768. Approved for only $5k (which looked kind of low to me given my scores). My FICO 8 score was 780 and I got approved for $10,000. 9 months later, my limit got bumped up to $20,000. I max out on the grocery shopping (though not on gas). Customer service has been awesome and I love the mobile app. Household income was $110k and score was 670 average across the 3 bureaus. Approved for $10k. I spend over $1000 on my AT&T iphones and got $250 bonus cash back!!! Have been rebuilding for 3 years. I have no late payments or baddies on my reports. I was approved for $10k. I was approved with a 670 EX score and a $4000 limit. Just as a reference, I got denied 2 weeks ago but my last collection fell off the report. With that, I got approved. My FICO 8 score is about 730. Income is around $100k. I applied and got approved for $15k. 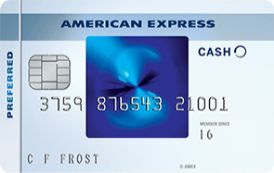 Chose the preferred over the regular card because I spend enough on groceries and gas to cover the annual fee. I put all my grocery shopping on this card, along with gasoline and department stores (if I do not have the store card). The rest of my spending goes to my Cap One QuickSilver 1.5%. I was approved for this card with a EX FICO 8 score of 680. Got a $4k credit line. Also (and this may be relevant to some of you), I BKed an Amex Green Card years ago and I was still approved! We spend so much at the supermarket, gas that we decided to get this card because the cash back is so worth it. We get it as a statement credit. We started off with a $2000 limit and when we applied, my score was 680. But since then, I have gotten a few increases and now my limit is $12000. My score is also now about 740 (according to the amex free fico score). I have been with Amex for over 25 years (have their Plat). But then I could not resist the cash back you can earn at the supermarket and gas stations. My score is 810 and I got a $20k limit with instant approval. My EQ score was 720 and income was $90k. I got a $8k limit. I have a short 1 year history and before I got this card, I had the Cap One secured. Score was 715 and I got approved for $1000. EX Fico was 680. I was approved for $10k with an income of $125k. Was approved instantly. Love the card so far. Got instantly approved for $25k. I also have Chase Freedom and Discover IT (but nowhere near the credit limits I got for this card). My util ratio is about 12%. I started out with the regular BCE. My score was 710, income was $90k and I got approved for $10k. Then I was offered the preferred and my limit was bumped up to $15k. On a net basis, I earn more rewards with the preferred despite the annual fee. I believe my experian score was pulled and at that time, my score was like 705. I was given a 5k limit and I reported a $60k income. I got the $250 bonus cash back for spending $1k within 3 months. Customer service has been awesome.